This is another recipe from The Sriracha Cookbook by Randy Clemens. In case you can’t tell, we really love sriracha in this house, so I’m sure we’ll be making our way through the cook book pretty rapidly. 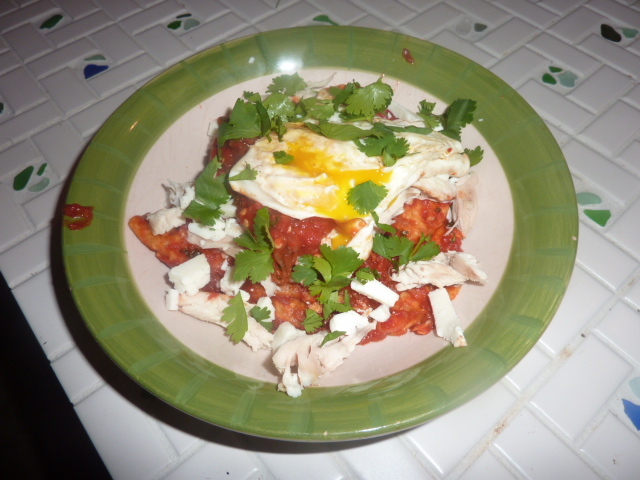 Chilaquiles are a Mexican peasant breakfast dish designed to use leftover, slightly stale tortillas. 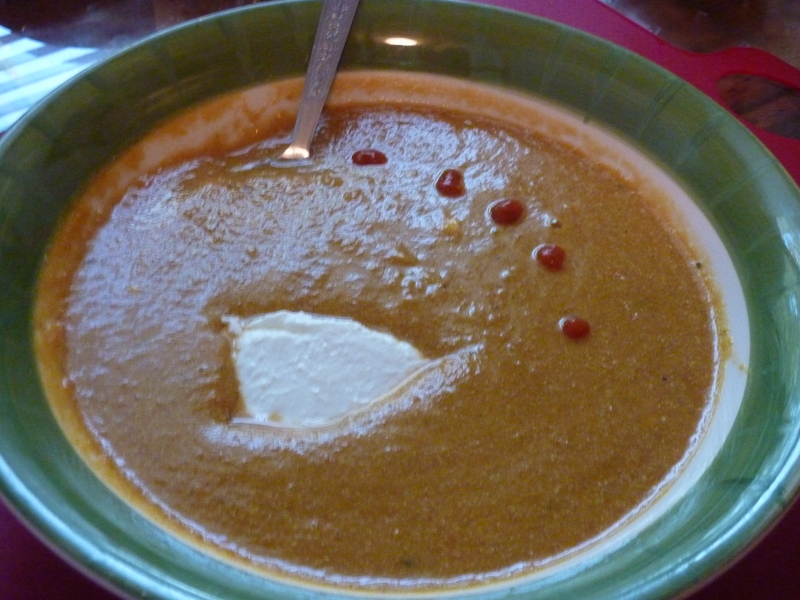 I absolutely loved the flavors of this dish, especially the creamy queso fresco as a foil to the spicy tomato sauce. The “breakfast-y” flavors of the leftover coffee and orange brined chicken in milk really worked well. In the future, I would love to try this with some homemade fried tortillas, but in a pinch during finals, the pre-made corn tortilla chips were absolutely delicious. I would also love to try this with chipotles in adobo or some thinly sliced jalapeños, although it was absolutely delicious as-is! In a food processor or blender, purée tomatoes and their liquid with sriracha until smooth. In a 10″ cast iron skillet, heat 2 tsp. canola oil over medium-high heat. Add onions, and sauté until lightly caramelized, 8-10 minutes. Add garlic and cook until fragrant, about 1-2 minutes. Add tomato/sriracha mixture and bring to a gentle boil. Lower heat and add most of cilantro, reserving few tbs. for garnish. Simmer until thickened, stirring occasionally, 10-12 minutes. Add tortilla chips and stir to coat with sauce. Be careful – you don’t want to break them. Heat for 1-2 minutes and allow chips to absorb the sauce. Taste and season with salt and pepper as necessary. In another pan, heat remaining tsp. canola oil. Fry two eggs until over easy. Serve in small bowls topped with chicken, cheese, cilantro and a fried runny egg.